Creative Community Planning provides clear access to emerging innovations in artistic, narrative, embodied and technological methods. Reflecting on the wide continuum of participatory practice, the authors explore the frontiers of community engagement within a fresh sustainability framework. Leading planning theorists, researchers and practitioners in the field reflect with the authors on the many successes and challenges in engaging with a diversity of people in rural and urban communities. These conversations reveal creativity as key to enhancing existing engagement practices. Concepts and practical applications thread through the book, including community visioning, participatory research and reporting, conflict resolution, poetry and planning language, theatre, photography, film and websites. 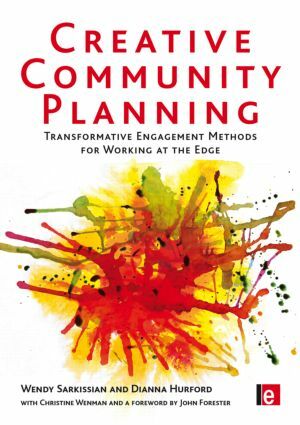 Wendy Sarkissian PhD, a speaker, planning practitioner, academic and workshop facilitator, has co-authored many award-winning books on planning and community engagement. Dianna Hurford MAP, poet and planner, has worked for the past 10 years in the field of affordable housing and homelessness in British Columbia, Canada. Christine Wenman MScP is a community and natural resource planner whose professional focus includes governance, education and citizen engagement.